This is another type of classic biscuit that was sold in the famous chain coffee cafe such as Starbucks. It is a crispy type of biscuits and preparation is definitely not difficult at all. 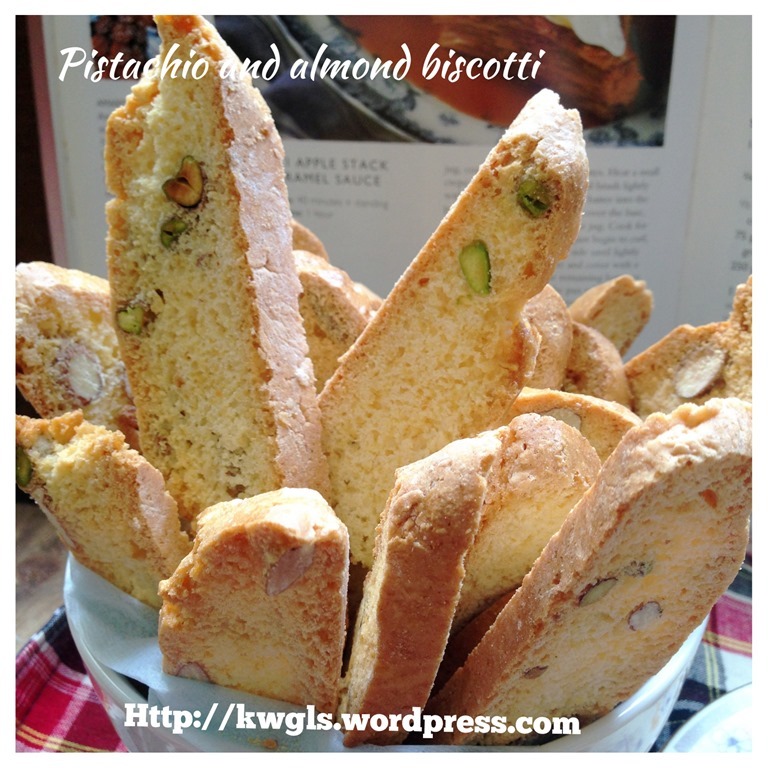 I get this recipe from another old cookbook – “The Essential Baking Cookbook” published by Murdoch Books in 2000. 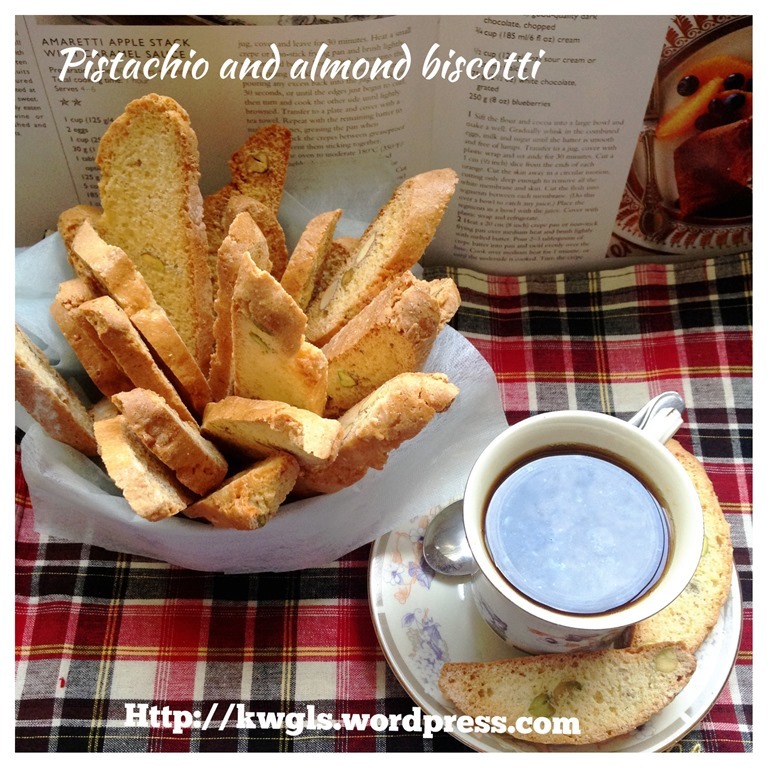 This is a simple recipe and in fact most of the traditional recipe are simple. 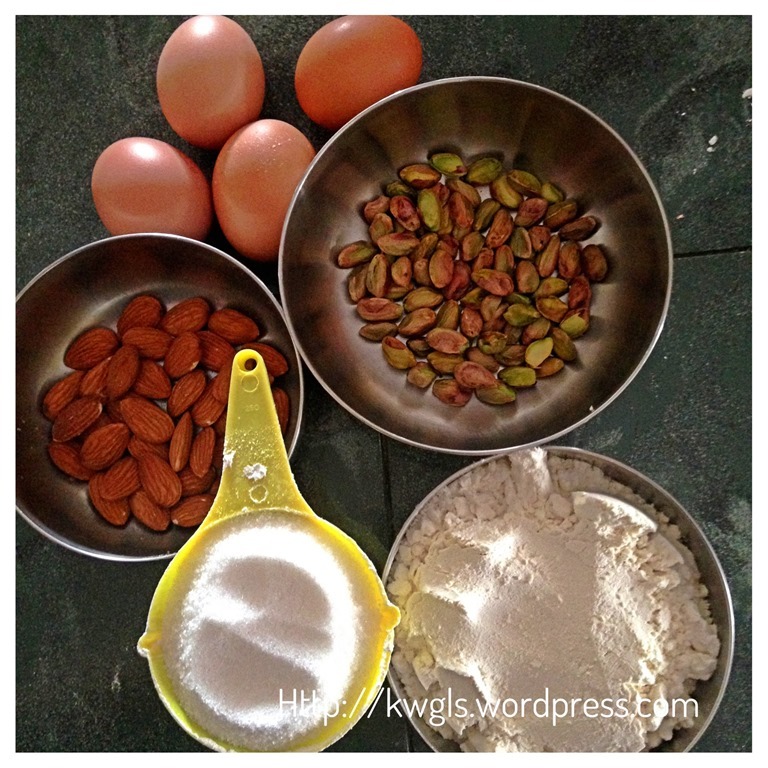 Both ingredients and method are rather simple too.. 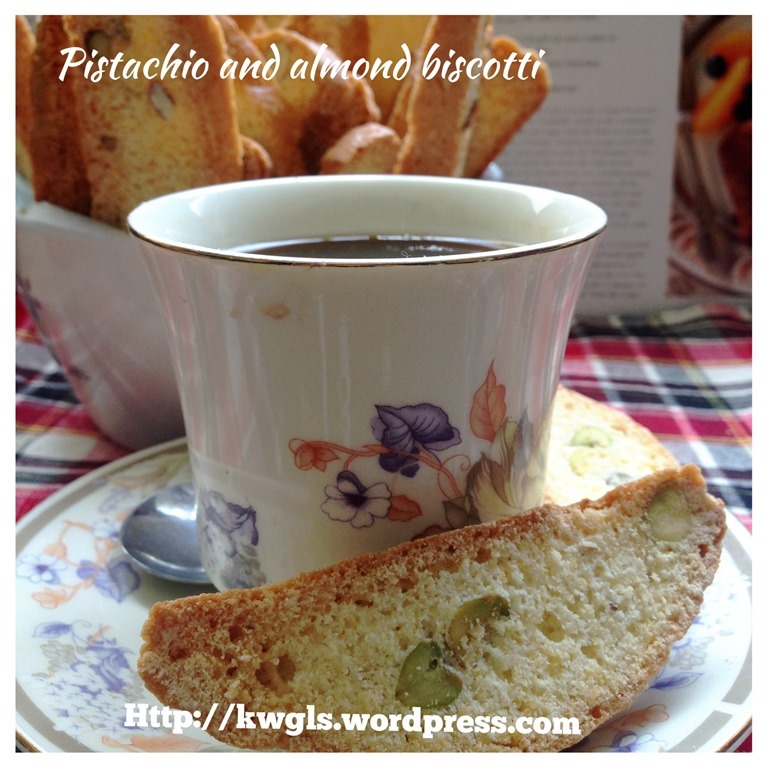 It is called biscotti because it is twice baked. 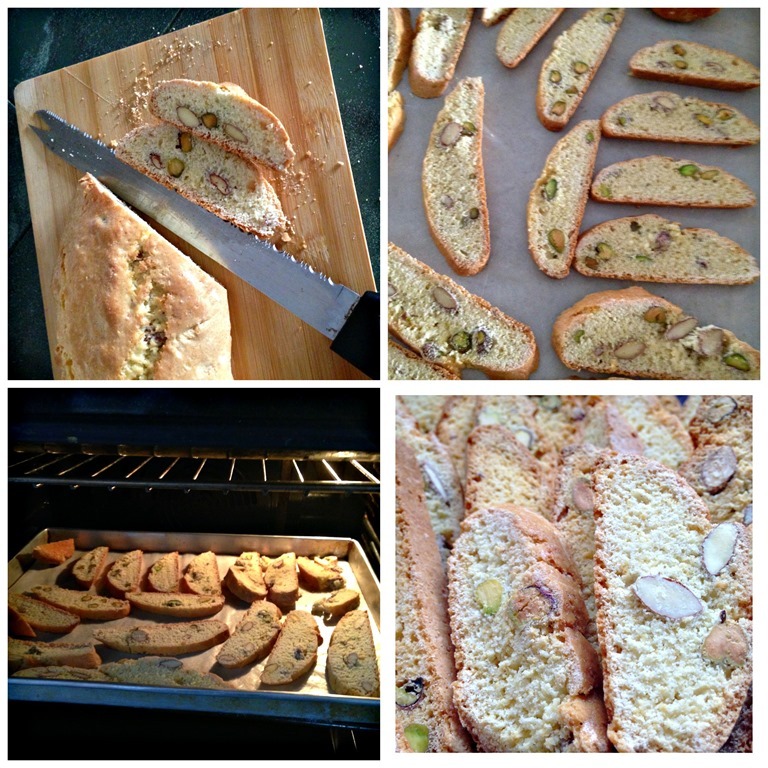 The dough is baked until cooked, sliced into small pieces and re baked again until it become crunchy. It is usually served with some hot beverages. In a big mixing bowl, put the sifted self raising flour and castor sugar. Make a well in the centre. Add 2 eggs and 1 egg yolk to the well. Used a tablespoon to stir until well combined. 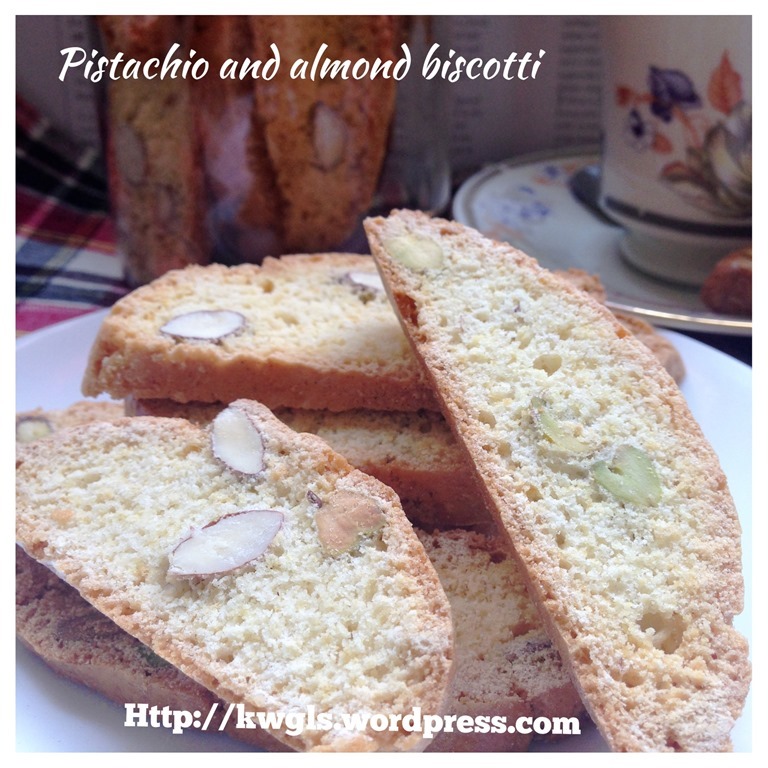 Add in the almonds and pistachios. Use hand to knead in a lightly floured surface for 2-3 minutes. If the dough is too stiff, sprinkle a little water on top of the dough. 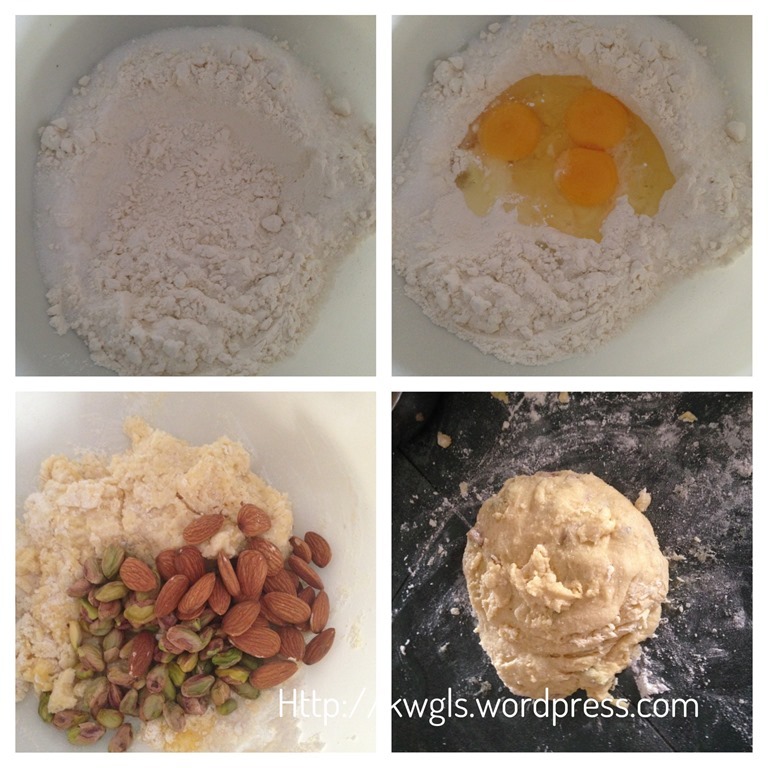 Divide the dough into two equal portions. 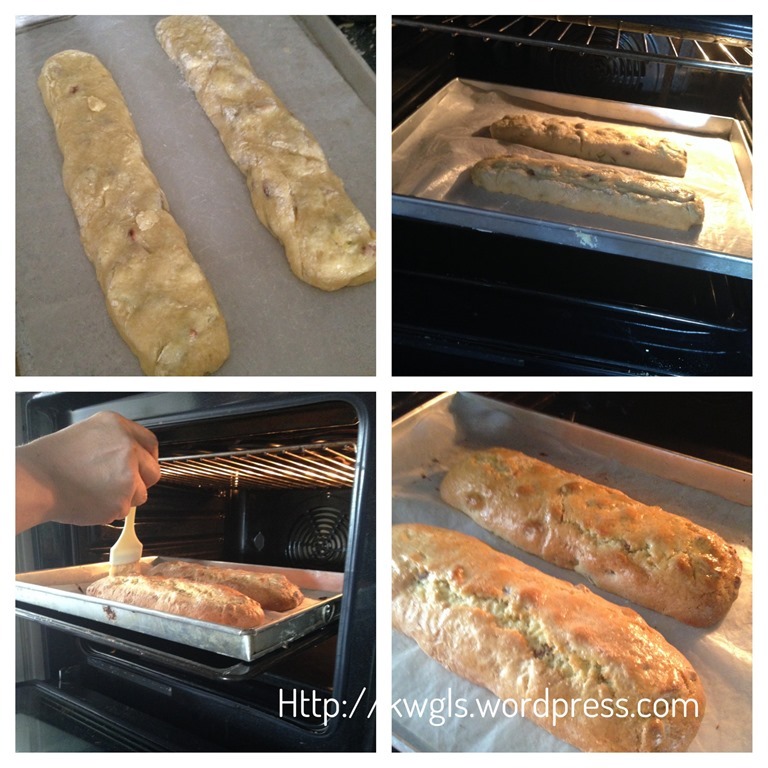 For each portion, shape it about 25cm long x 8 cm wide (or 10 inches x 3 inches). Slightly flatten the dough and leave adequate space for the dough to expand when baked. Beat the remaining one egg and egg wash the dough. Bake in the oven at 180 degree Celsius for 35 minutes. After 35 minutes, remove from oven and let it cool. Meanwhile reduce the oven temperature to 150 degree Celsius. 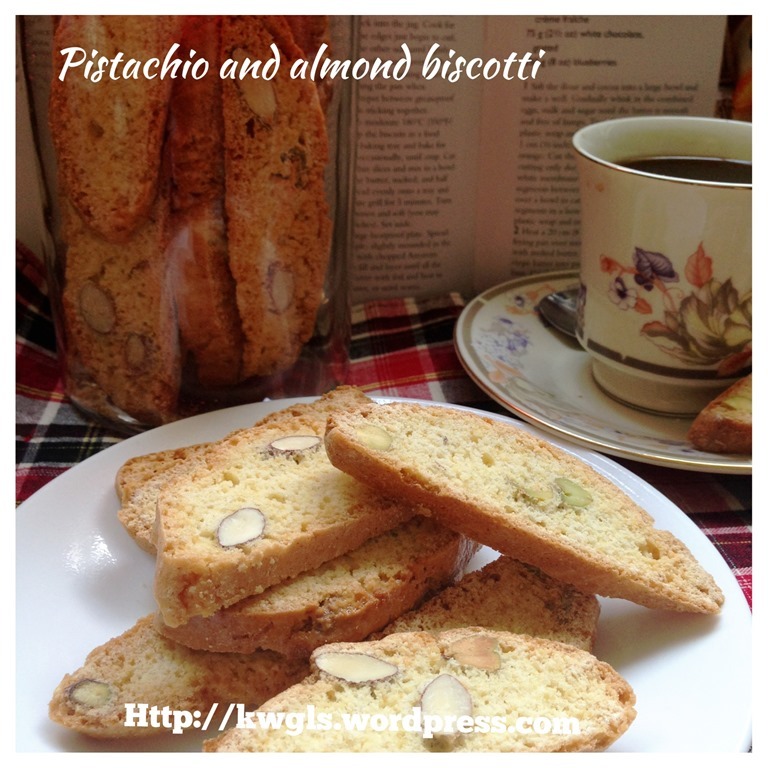 When the biscotti have cooled slightly, use a serrated knife to cut the log into 4mm thickness. 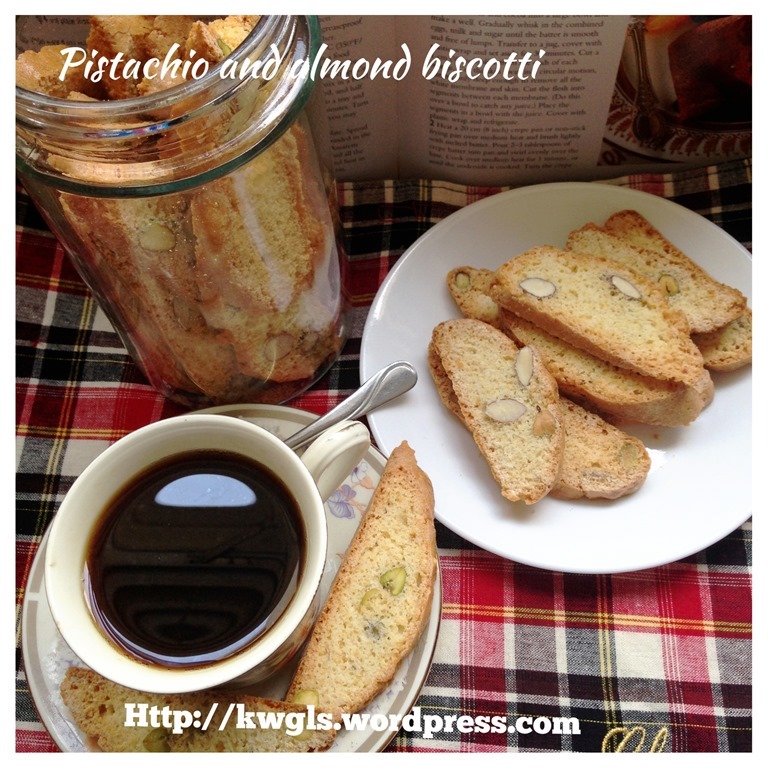 Place the cut biscotti on the baking tray with the flat side down.Bake in the oven at 150 degree Celsius for another 8 minutes or until crunchy and dry. Cool in a wire rack and store in an air tight container for up to a week of two. Best served with some breakfast beverages. 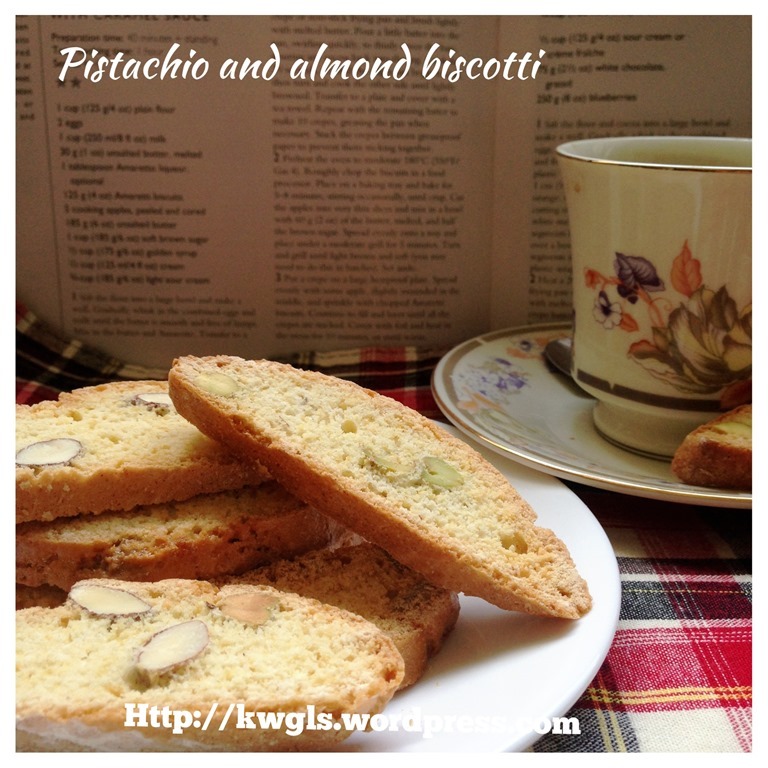 It is not a difficult bake and I like the crunchiness of biscuits and the nuts. 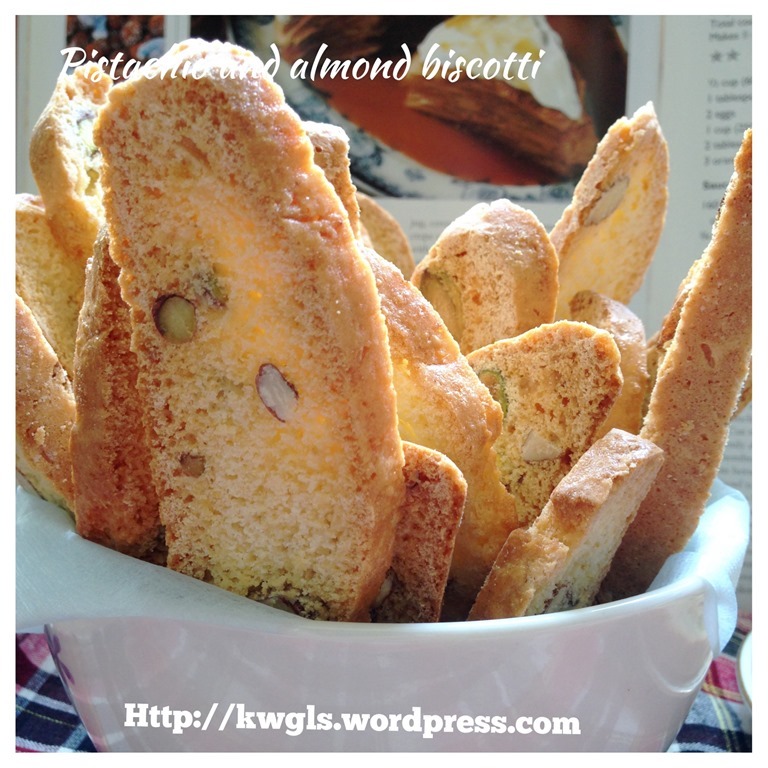 There is no fix and fast rule of the types of nuts used, possibly you want to consider some chocolate biscotti with macadamia nuts? 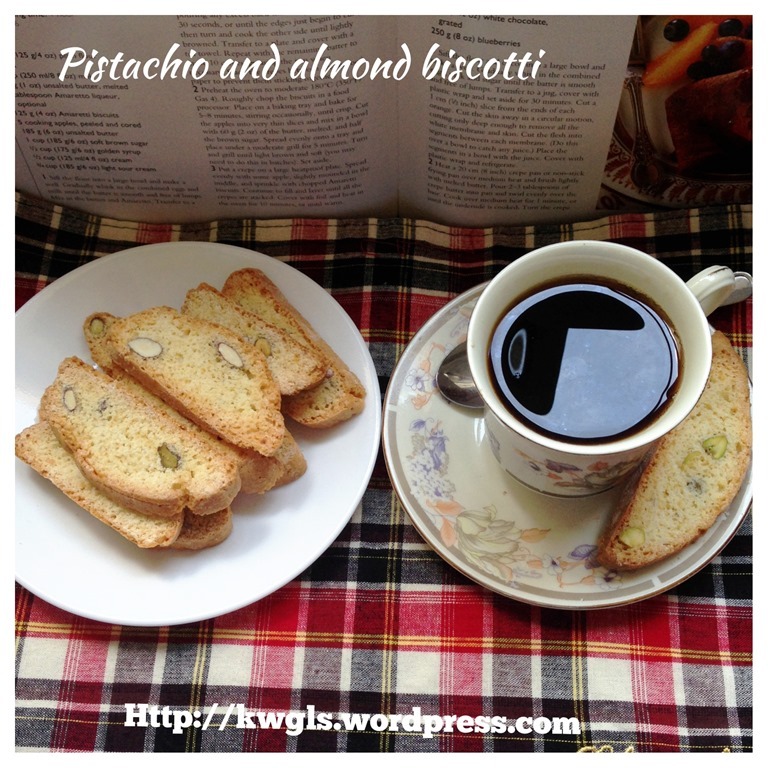 With this recipe, I believed you will not need to buy the biscotti from Starbucks any more! Ha-ha. Hope you like this simple post a day. Cheers and have a nice day. 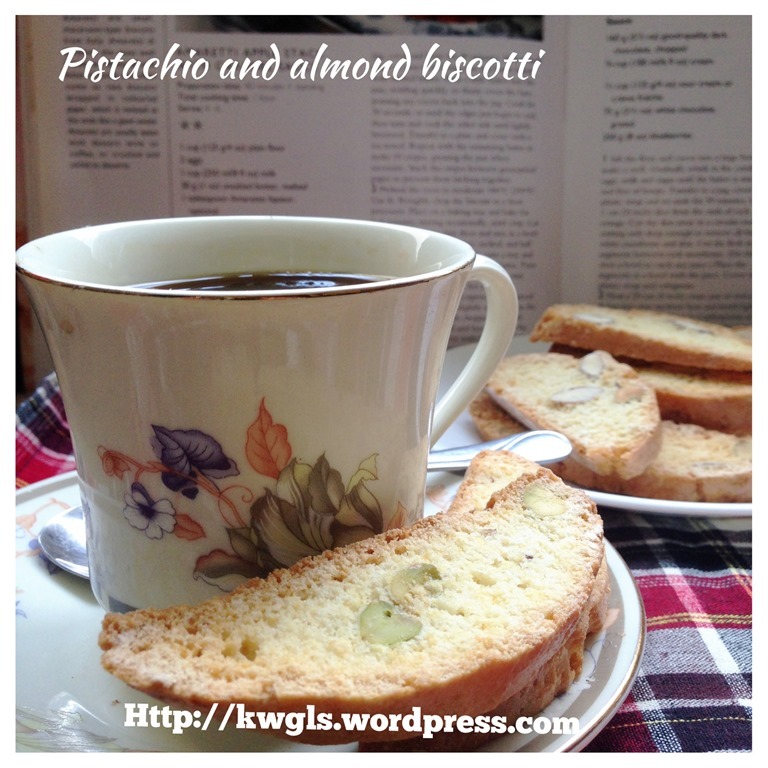 This entry was posted in Cakes and cookies, Food Preparation Series and tagged 8, almond biscotti, GUAI SHU SHU, Guaishushu, kenneth goh, pistachio and almond biscotti, pistachio biscotti, postaday, 开心果杏仁饼干， 杏仁饼干，意大利杏仁饼干， biscotti. Bookmark the permalink. These few weeks email received from unable to see the picture you attached. It was blocked, I wonder do you block it or someone else. I really your follow fan and quite disappointed cannot see the photo.